Heat the oven to 325°. Toss the bread cubes with the 3 tablespoons oil and spread on a large baking sheet. Bake, stirring once or twice, until crisp and lightly browned on the outside but still soft inside, about 15 minutes. Let cool. In a large glass or stainless-steel bowl, whisk the vinegar, garlic, salt, and pepper. Add the remaining 2/3 cup oil slowly, whisking. Add the toasted bread, cheese, tomatoes, celery, onion, and parsley and toss to coat. Let sit for 5 minutes. Add the lettuce and ham and toss again. 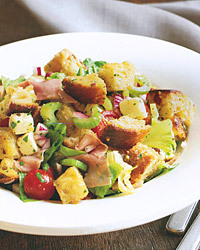 This full-flavored salad can easily partner a red wineeven, because of its ham and cheese, one with some tannin. A Beaujolais-Villages, light-bodied, fruity, and just a bit tannic, will be delicious.